Supplies used: CTMH Charlotte Paper Packet, CTMH Charlotte Complements, CTMH Dimensional Elements (retired), CTMH Black Cardstock, CTMH Whisper Cardstock, CTMH Whisper Ink, CTMH White Cards & Envelopes Value Pack, and Tim Holtz embossing folder. Welcome to this month’s CTMH Technique Blog Hop. If you have already started the hop, you should be coming from Sheila Bennett. 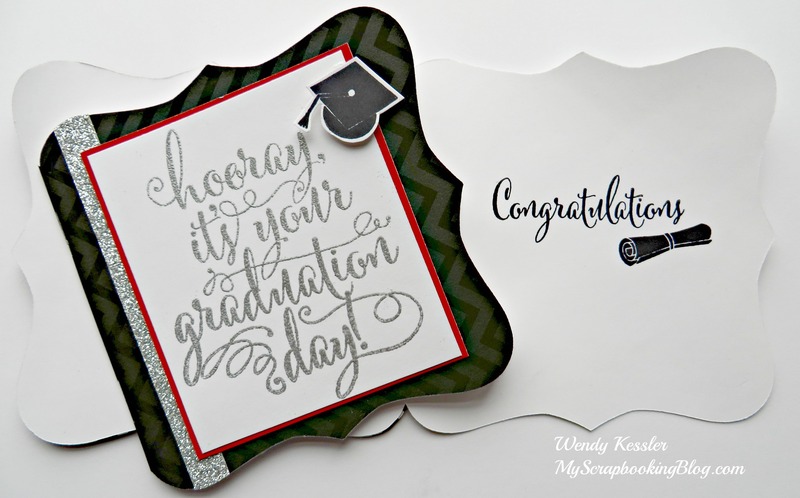 Supplies used are all Close to My Heart: Diploma Day Stamp Set, Art Philosophy Cricut cartridge, Cardstock (White Daisy & Cranberry), Paper Fundamentals Basic Assortment, Versamark Ink, Silver Embossing Powder, Archival Black Ink, and Silver Shimmer Trim. I have been itching to use this stamp set since I got it and I absolutely LOVE it! I also bought a pack of 4×4 envelopes not realizing they weren’t standard size so I combined these two need-to-use-items to create this graduation card. The embossing works very well with this stamp and why not combine this technique with the Paper Fundamentals (which are embossed cardstock sheets). I cut two cards in White Daisy (p.53 in the Art Philosophy booklet) then one additional card in the Black Embossed paper and cut this in half (one for each card front). Red and black are the school colors here so I added a thin strip of red border. You can use your own school colors or keep it neutral. My daughter said they are cute and has informed me that I need to make a lot more. I guess I can say that I will get my moneys worth out of this stamp set!! Now hop on over to Haley Dyer! Welcome to this month’s CTMH Technique Blog Hop. Today you will see how we’ve used embossing folders. If you have already started the hop, you should be coming from Joy McHargue. 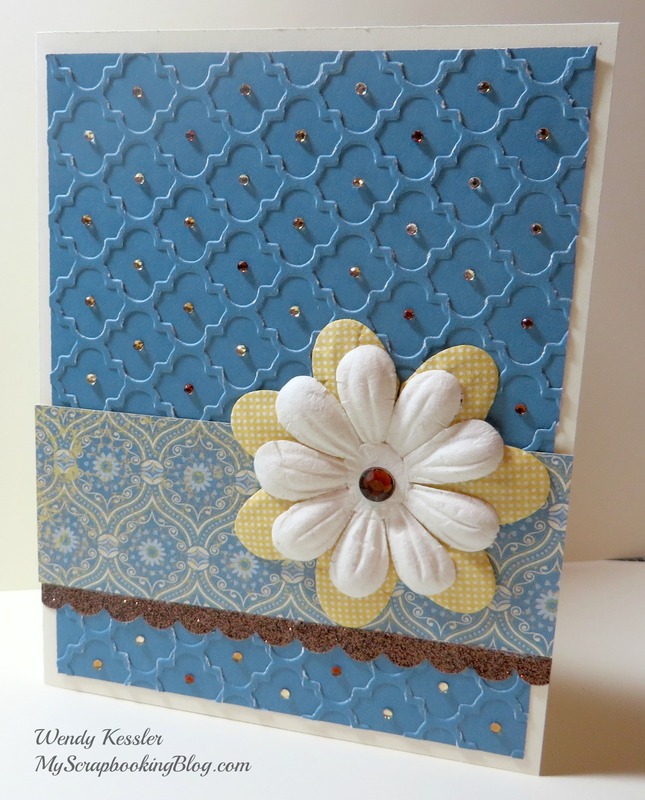 Supplies used are all Close to My Heart: Quatrefoil Embossing Folder, Cardstock (Indian Corn Blue, Colonial White), Scalloped Border Punch, Bronze Shimmer Trim, Paper Flowers (retired), Jubilee Paper Packet, and Brown & Tan Sparkles Assortment. Now hop on over to Michelle Loncar! Alcohol Marker Madness features coloring stamp images with alcohol-based markers for a smooth, vibrant look.